Since 1965, our team in Pompano Beach for Precast Concrete Scuppers has worked closely with industry professionals to deliver cost-effective customizations and long-lasting installations. Atlantic Coast Precast is known for our easy-to-order, personalized precast produces like our scuppers and downspout splash guards. These cost-effective drainage solutions are designed to allow water to exit through outlets, guiding water away safely. If you are a contractor, designer, engineer, or architect in South Florida, call our team for affordable, durable, and customized scuppers made from precast materials. Since precast is watertight and will actually strengthen with age, it's a smart choice in Pompano Beach for precast concrete scuppers. We can offer decades of experience personalizing your scuppers for both decorative and functional purposes. Call for a FREE quote to get started right away, today. Atlantic Coast Precast is known for professional services and handsome, dependable precast products. 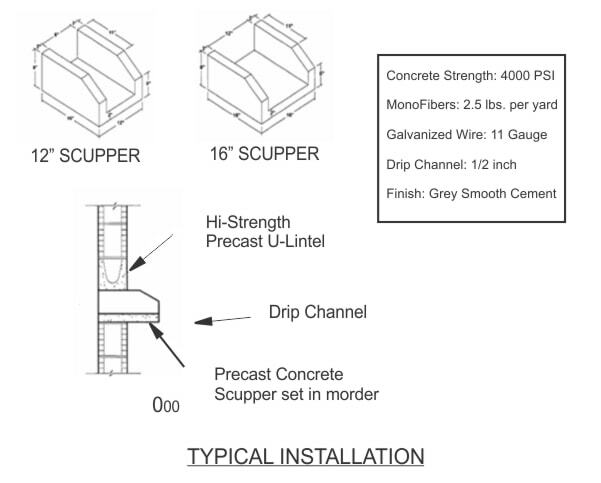 When you're seeking a sustainable solution for rainwater management in Pompano Beach, precast concrete scuppers can be considered an integral part of any gutter system when you have a built-up or flat roof. Our scuppers can fit right into your parapet walls or gravel stops to preventing ponding water from causing rotting wood or mold in your structure.